I've just taken a look back at 2013's year in review, and I'm blown away by all the projects I managed to complete last year. This year I feel like I've done an incredible amount of textile work, but it doesn't seem to have amounted to very many completed projects. One skirt, a couple of surface designs, a knitted baby blanket, a knitted summer cardigan, and a hell of a lot of assignments. I think I probably took on one too many courses this year. 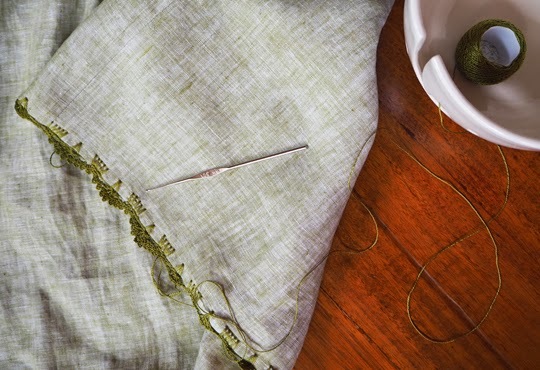 While I've been learning different embroidery stitch techniques in one of them – and it was worth it when I was still working and looking for textile projects to keep me focussed while I waited for that long period of the company sale lock-in to finish, it's probably not something I'll continue in 2015. I'd rather focus on projects of my own design. Anyway, that's something to think about over the next couple of weeks as we head into the new year. 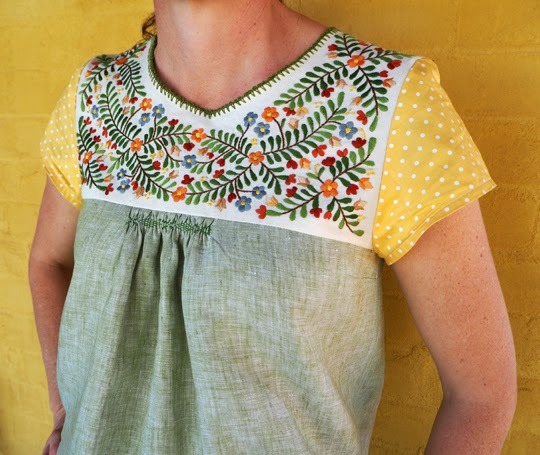 There is one project I've just completed (in time for Christmas) that I can share with you here – a Mexican blouse that I made for my sister. It's a pattern I modified from the one I learnt to do in Mexico. 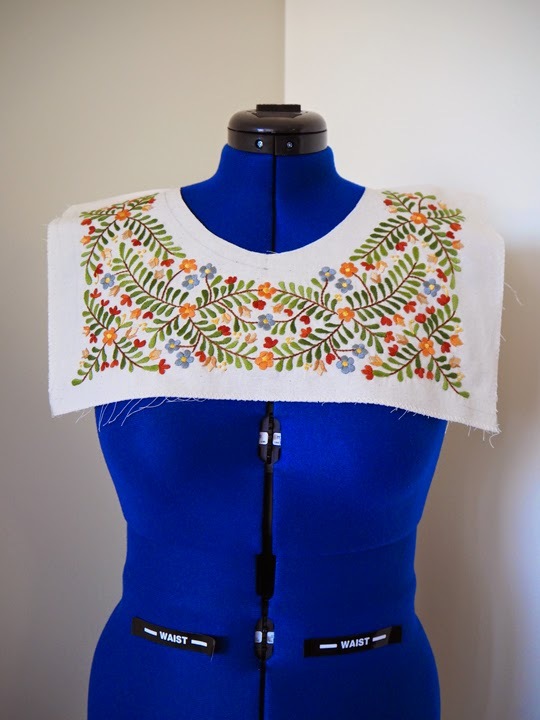 I used a more Autumn-like palette, added a mix of fabrics and designed the floral bodice for the stitching. I timed myself on the bodice, which took less than 40 hours. It's not too bad considering how long a garment takes to knit, but there's no way you could make a living out of it, and yet that's what I know hundreds of women do in Mexico. This is what it looked like last weekend. I had done the smocking-type work on the body first, then moved onto the bodice, as I knew everything after that wouldn't take too long. I tell you what though, cutting into that bodice to make the neckline was a nerve-wracking experience! Then, over these last few days before Christmas I crocheted around the neckline, set the sleeves in and crocheted around the bottom of the blouse. Mum gave me this lovely yarn bowl as an early Christmas present, which was very handy for keeping the thread close by as I worked my way around. So, there we have it! The last project for 2014 – and probably my favourite – made it just in time for year's end. I hope those of you making gifts for Christmas got them finished in time, without too much stress and panic, and I wish everyone a happy handmade 2015. 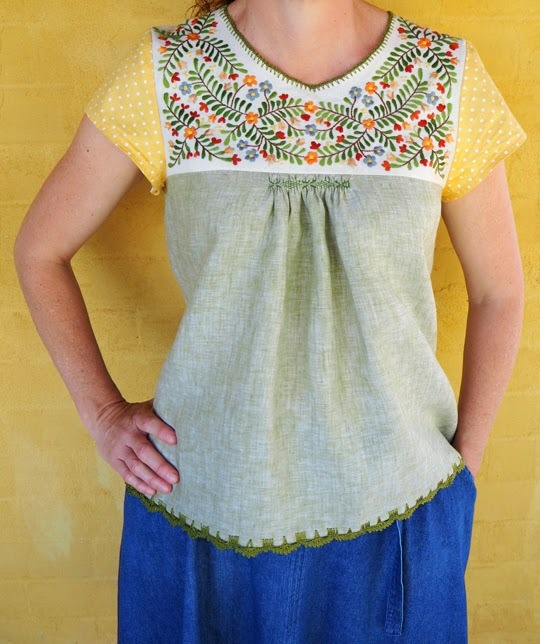 Don't forget you can still sign up to learn how to make one of these blouses at the Craft Victoria Summer School! Thanks for getting in touch Susie and I'm glad you like the blog! I don't know of any online courses at the moment, but I've had a few requests now through email and Instagram, so I'm exploring the option myself. I'll keep you posted with progress.